A few years ago I had a 2000 Dodge Ram truck that the voltage regulator went out on. Having worked on many older 70’s and 80’s cars and trucks at first I thought no big deal just need to swap out the external voltage regulator. To my surprise the voltage regulator now comes built into the onboard-computer which used is around $400-$600 dollars. This was frustrating to say the least since the rest of the truck ran fine and only the voltage was not regulated. So remembering how the old Dodges worked with a external regulator I began searching the forums looking to see how to wire one up and bypass the computer/PCM/ ECM. To my surprise there were many others with the same thought and experience doing what I was looking for. After reading through the forums and understanding how they are wired I soon had my Dodge truck up and working in no time. In this post I will show how to build one or how I do it. I also made a video making one which is at the bottom of this post. Here are the parts I use. A junk yard would have these parts or they can be ordered online and are cheap. All the parts should be less than $30-$35 dollars on eBay or Amazon. UPDATE: A seller on Amazon has a Dodge adjustable regulator and pig tail. The adjustable regulator would be a good option for those having problems with high voltage output. The adjustment is a small potentiometer on the back of the unit that is turned with a small screwdriver to up or lower the output. It is a good idea to use an inline fuse. Any Dodge external regulator from 1971-1989 is wired the same. I did find that the regulators from the 1970’s put out less voltage than the 1980’s versions but the wiring is the same. The wiring is simple enough with only three wires needed and a good ground. The center pole on the regulator needs two wires one that goes to the positive side of the battery and one that goes to the alternator. The outer side pole on the regulator simply goes to the alternator also. 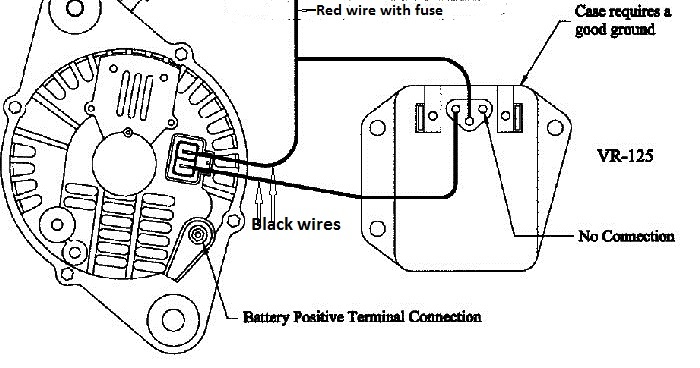 The Red wire in the above picture goes to the positive side of the battery, the other two wires go to the back of the alternator. 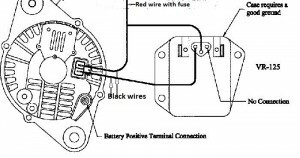 If you look at the back of a alternator there will be three connections, one large gauge wire going to the starter that hooks to the positive battery terminal and two small wires that go to the computer. 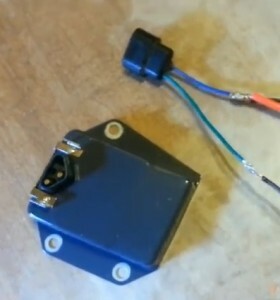 The two small wires are what regulate the voltage and are the only connections that need modifying on the alternator. The two wires that go into the alternator from the voltage regulator do not matter and an are interchangeable. The only wire that is very important (since it will fry the regulator if done wrong) is the center pole on the regulator that goes to the positive battery terminal. If the center terminal wire going to the positive side of the battery is wired wrong than the regulator will fry. 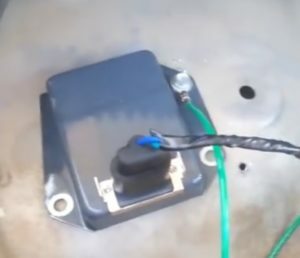 A very important step also is the center regulator wire will drain the battery slowly if left connected with the vehicle not running. 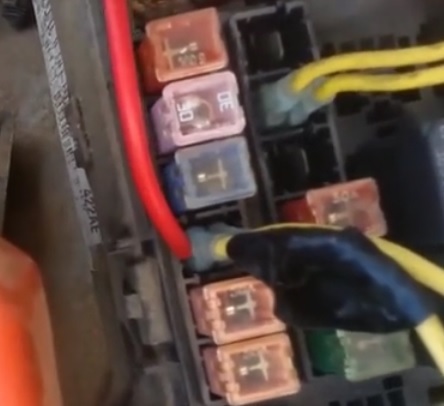 To stop it from draining the battery it is usually wired into the fuse box on at least a 20 Amp fuse so when the vehicle is turned off it breaks the connection. Another option is to put in a manual on off switch somewhere that will break the connection manually. Either way simply remember if it is left hooked to the positive terminal it will slowly drain the battery. Another important step is that the external regulator must have a good ground to the alternator. If there is not a good ground than the voltage will swing widely. A simple way to be sure it is grounded good is to run a ground wire from the alternator casing to the external voltage regulator casing. Wiring up a voltage regulator for a Dodge, Jeep, or any Chrysler vehicle is not complicated and done easily. I made a video of building one here for a visual walk through of making one. I have the perfect solution. Go buy something from the 1980’s that is fuel injected ( I bought an 85 Ford Ranger and a 1990 Ram). You can still get most of the parts and they’re easy to fix and reliable too. And, since it’s over 30 years in some states you can get Antique Plates. You never have to buy tabs or emission check it ever again. I’ve got one thing to say for all you senceless tree huggers who destroy people’s lives with their environmental BS, F- U! If the diodes in the PCM are bad do they cause a drain back like diodes in a bad alternator? Hey great idea! THE PROBLEM WITH THIS IS CALLED DIODE DRAIN BACK. ALL ALTERNATORS MAKE 3 PHASE CURRENT. When a diode goes bad (inside a regulator or a PCM) they drain voltage from the battery backwards to ground. ALL CARS REQUIRE RECTIFICATION OF 3 PHASE CURRENT TO 12vdc. So the all have to use something like a diode to rectify the current. So if you bypass the PCM with a faulty rectifier and do not remove it from the system–IT WILL STILL DRAIN VOLTAGE. i did the external regulator. I used a regulator from a dodge( brand new from autozone) and the factory oem plug. A good ground is very important! Make sure you have a good ground on the regulator. Hope you hooked them to the alternator side of the wires you cut. I have a 03 dodge Dakota and I put a 1990 voltage regulator on it. I am get an over charge it’s putting out about 16 volts when I get the Rpms over 2000. I’ve checked my gound wire and I even added a ground wire to the battery terminal. What should I do. On engine start, the check gauges light comes on, the fuel gauge snaps all the way to the right (full) position, and the oil pressure gauge also snaps full right. The ammeter goes all the way to the left. After driving for a while, something happens. Oil pressure and ammeter return to normal. Fuel gauge stays at full. Check gauge light goes out. In connecting the new regulator, I used the old two-wire plug on the back of the alternator by cutting the wires and splicing in new wires. The old wires are thin, maybe 16 or 18 gauge. I used 14 gauge. Would mixing wires cause a problem? Not sure if I have a good ground. Couldn’t find a good place to connect the ground to the alternator, so I’m relying on the screws securing the new regulator to the sheet metal for a ground. Should this work? The one change I have noticed is that when driving and the oil pressure gauge returns to normal, the fuel gauge stays at full and the ammeter swings all the way to the right, indicating the alternator is charging at nearly 18 volts. Hmmm. Should I rewire the connector with all 14 gauge wire? Should I use thinner wire throughout? Should I try to improve the ground? Thanks for all the help you have already given us. Using an external voltage regulator separates the charging system from the vehicle. It should not be effecting any dashboard lights except charging. Check with a volt meter it is not over charging and maintaining the voltage correctly, that is all it does. Well, I managed to get a good ground to the alternator and everything worked. Now I have a slightly different problem. Bob said to wire the regulator through the fusebox so the regulator wouldn’t draw down the battery. I didn’t know how to do that, so I thought I could just unplug the wiring pigtail from the regulator. Now I have a very dead battery and the ammeter shows the battery not being charged when I jump start the engine. I guess unplugging the regulator didn’t get the job done? Hello there, I’m having a hard time with the charging system for my 1975 Dodge D-100 custom 225 SLANT 6. I’ve replaced the Alternator 65 AMP. & THE VOLTAGE REGULATOR & THE ELECTRONIC MODULATOR – LOTS OF PEOPLE WILL CALL IT AS THE BRAIN BOX. SO I’M RUNNING THE ENGINE & LATER I NOTICED THAT THE LIGHTS IN THE CAB IS GETTING VERY DIM – THEN IN A BIT THE ENGINE SHUTS OFF AND I HAVE A DEAD BATTERY. SO IF YOU HAVE ANY INFORMATION TO GIVE ME I APPRECIATE IT. SO PLEASE ????? LET ME KNOW ANY INFORMATION??????? terry you should do a voltage drop test on your battery cables. this test is obviously better if you put a load on the battery and cable system but can be done without a load too. just check with volt meter to see voltages from one point to the next. i believe you may just have excessively corroded cables where you cant see it unless you pull insulation off the whole cable. which you shouldnt do unless you replace the whole cable. good luck. Followed direction perfect…. My 97 jeep Wrangler 4.0 5 speed seemed to have a failing pcu, only because the voltage regulator is controlled by the pcu. I could not locate the proper pcu swap and as I was under a time crunch I opted to give the external regulator swap a go…. It has all gone flawless except… The battery/voltage Gage on the dash pegs out under load. I dropped down to a 10amp inline fuse to see if it would blow…it hasn’t. Any thoughts? Nice write up! The only thing I might add regarding the 15V over-voltage issue is to make sure the ‘red’ switched circuit has adequate connectivity to the battery – it functions both as a current supply for the field circuit and, more importantly, a sense wire for the external regulator. As you may know, if the key switched circuit is not able to supply sufficient current to the field winding (due to high resistance in fuse box or poor connectivity to positive battery voltage), it will cause a drop in voltage on the regulator sense circuit as well (because they are both on the same wire in this installation). This in turn causes the regulator field current to try to increase further to generate more voltage at the ‘output post’ to compensate for the low voltage sensed by the regulator. The end result is the battery will be over charged and boil off the electrolyte (not good!) and potentially could fry your electronics. My 2c worth would be to insert a relay that is triggered by the keyed circuit in the fusebox, and run the red circuit directly (via the relay for on/off) to the battery. This provides up to 25/30Amps of independant low resistance 12V power directly to the voltage regulator ensuring that there isn’t any parasitic losses on the sense circuit. It also ensures that the battery is receiving full voltage (in the event of any dodgy ground or power circuit connections) at the terminals to maintain a healthy state of charge. Electrician here for 40 yrs. I did this mod to my 97 Jeep when it was consistently undercharging. What I found was that Marcus is the one guy that is right about the 15 volt issue and his suggestion will fix it. The ASD relay feeds the ASD input on the PCM, which then drives the Gen field SOURCE 12v and the Gen field driver. What I found was my initial startup was charging at 14.8 ish with a good digital meter. Too high. So I checked for a voltage drop to the Gen Source, and there it was, a drop of .25 volts. So the regulator being driven by the field source is going to be that much low and it will try to bump up the field current to get it to around 14.5 , which it may never get to because the PCM is where the voltage is getting lost. The whole idea of the external regulator in the first place is usually to take the defective regulator in the PCM out of the picture anyhow so it makes sense to do just that by using the field source from the PCM to switch a relay from the battery to the + connection on the regulator. Doing so will let the regulator see what the battery itself is seeing in terms of voltage. This also makes you wonder what else might be wrong in the pcm if it can’t source BAT voltage.. So I did the external regulator on my 2005 Dodge Magnum. It seems to be working. But my battery lite is staying on all the time. Is this because of bypassing the internal regulator? very nice, do YOU have a email address. Will this work if the ecm. Is completely fried? Will this work on a v10 dodge? Ok, so I hooked up a voltage regulator everything was properly grounded and connected. But my issue is the wire from the battery to the toggle switch for on/off melted off the protection on the wire. I don’t know if I should go bigger or maybe I should have had a fuse inbetween these 2. either way I need some major assistance. I don’t know what had happened or how it happened but I do know that the regulator was running at 15. maybe .50 more but no less everything worked right just that wire fried quickly for the switch. just the one from the battery to the switch. I always use a fuse just in case something like that happens. The gauge may need to be thicker or the switch is grounding out somewhere. Let us know what you find. Tha wire hit a ground some where if it fried that fast. Hello, I just purchased a 2011 Durango. 3.6 liter. 180 amp alternator. is it possible to put an external voltage regulator to these later Style PCM controlled alternators? I see the kits available for the early Durangos but not for the later models. Seems my later style Durango has different wiring than the earlier models. Usually there are two field wires coming from the alternator along with the bigger battery wire. The wires going to my alternator are as follows: 1 thick wire going to battery, and two small wires – one is labeled field and the other is battery sense. So since my alternator obviously does not have 2 field wires how is this external regulator conversion possible? My year Durango has a alternator recall but unfortunately my VIN number does not fall under the recall. The recall is for the 160 amp alternators while I have a 180 amp. Alternator failed in a major way, internally shorting killing my battery and PCM with it. I was very lucky nothing caught fire. I have been searching and searching the web for a long time but can’t seem to find anyone with the later style Durangos or similar that has converted it to a external regulator.I’m thinking it’s not possible due to the fact it only has one field wire.if it is possible I would appreciate it very much if someone could help. One odd thing to mention is, since I know for a fact my alternator is not charging, I am getting no battery or alternator light. Alternator and battery have been replaced.even verified my new alternator is good by taking it to a local Alternator Rebuild shop to test. they said it was working fine. I would appreciate any help in getting me to converting my vehicle to an external regulator. Did you ever figure this out? I have same model and issue. I did the bypass but now I’m getting 17 volts out of the alternator and the car simply does not like it at all! We just installed an external voltage regulator on a 1999 Jeep Wrangler after verifying the issue was the PCM voltage regulator. The 12 V wire to the alternator (green with orange stripe) was tapped to supply voltage to the external voltage regulator and the alternator field supply. Power to this wire is switches on and off with the ignition switch, so that issue disappears. 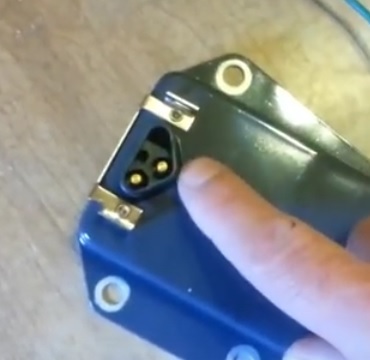 The alternator field return wire (green to the PCM) was cut and wired to the field connection on the external voltage regulator. To prevent an MIL light, a 10 ohm resistor is connected from the 12V alternator supply wire (green with orange strip) to the cut green wire back to the PCM. 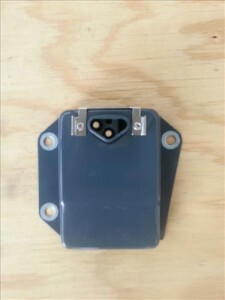 Since the PCM voltage regulator output doesn’t switch to ground properly (PCM connector C2, pin 10), the wattage of the resistor doesn’t matter. A 1/4 watt resistor works fine and doesn’t get hot because the PCM output is broken. (If the PCM works, a 1/4 watt resistor is too small, will get very hot and fail quickly.) The purpose of the resistor is to supply voltage back to the PCM to trick it into thinking the alternator field coil is still connected. Our installation works great and took about an hour to install. The voltage regulator was purchased at Advanced Auto. It is for a 1980 Dodge Ramcharger with 5.9L 360CI V8 Carb. We used Carquest BWD Voltage Regulator , Part # R296P ($20) with connector Part # PT173 ($11). Our alternator’s max field current is around 4 amps, so 16 or 18 AWG stranded wire works fine. It is important the voltage regulator case is well grounded to the car chassis, not necessarily to the alternator case. The external voltage regulator case connection supplies a return path back to the battery, not to the alternator. A continuity check from the battery negative terminal to the external voltage regulator case tells the story. The lower the ohms, the better the connection. how did you determine the pcm was bad? no no no buddy is this Ronald Cubitt? Would you be able to draw a quick schematic for what you did? The regulator in my PCM is still good, what would happen if I just tapped in on the 2 regulator wires coming from the PCM and left them hooked up to the PCM also, along with installing the new external regular? The external regulator fix is great, but the CEL won’t go off because the ECM is still looking for a load across the two wires that were removed from the back of the alternator, the field wires. While there is a kit that includes a resistor to solve this problem, if someone might have access to what that load was , it would be much cheaper to get a resistor at an electronics supply rather than spend more (double of triple) just because it is from a kit. I tied into the thick alternator to battery wire with the middle external voltage regular (red) wire and just connected a wire to one of the terminals on the back of the alternator .check eng light stays on but it works.will something fry ? Let me know what you think. There should be two small wires going to the alternator. I seem to have this problem with my 2005 Sebring Convertible. It’s an intermittent problem – every time I think it’s fixed, I can drive the car for hours or days and it will suddenly go nuts again. I once had the alternator tested in the vehicle, WHILE it was acting up, and it failed saying “bad voltage regulator.” The parts guy sold me a new alternator – telling me the VR was in the Alternator. I replaced it – it worked fine for a couple of days then went nuts again. When you say to connect the wire to the battery or the fuse-panel, how do you do that? Where would you connect the wire to the fuse panel to ensure it’s shut off when the key is turned off? Also, rather than run the wire to the battery or fuse-panel, could you just connect it to the charging post on the alternator itself? after all, it connects from there to the battery, right? or would that fry the whole deal due to the amount of current being put out by the alternator? I’m stuck with no vehicle right now and live WAY out in the country so I *REALLY* need my car to be reliable! If you’d like to chat and you could call me at 8170, I’d be ETERNALLY grateful! Even if you choose not to respond, I’m thankful for the info you’ve already supplied! If a external regulator is built and installed than is will slowly drain the battery when the key is off. This is the reason for breaking the connection to the positive side of the battery. Most wire the external regulator into the fuse box since the key will turn off power to the box. For example the radio fuse can be controlled with the key and will break a connection when the key is turned off. Sometime the fuse box is hard to get to so others install a switch and manually break the connection. Your idea about using a diode sounds like it might work. I have never tried it. Remember this is all a home built modification so if you have a better way to build one definitely do it. This is all about saving $400-$1000 dollars by building your own voltage regulator, so besides getting it working there really is no one way. The above is simply how I do it. It is possible for a bad voltage regulator to fry a alternator so you may want to test it again at a auto supply store. One last thing is that the voltage can also vary if the computer/ECM does not have a good ground to the case. On some cars I have looked at running a good ground wire to the alternator can solve this when they are not grounded good. If it doesn’t work with a good ground than I install a external voltage regulator. Good luck let me know what happens.